February, 1933. Snow was beginning to fall fast as Sheriff James Thompson drove up into the Green Mountains of Wyoming. Temperatures had been dropping and he wanted to get this business done before the mountain roads became impassible. The heavily rutted dirt road was now coated with snow as he made his way toward the ranch house. Stopping under the big Pine, he stepped down on the floor break and turned the motor off. Thompson opened the car door to a bone chilling wind and pelting snow to his forehead. 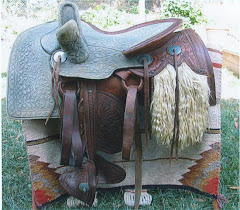 Quickly placing his hat upon his head, he stood up and pulled the heavy woolen collar high on his neck, adjusting his belt and holster, checking to make sure the cold, metal cuffs were in place on his belt. “I need to speak with your husband, ma’am.” Sheriff Thompson spoke kindly and quietly to the woman. Fifty, Fifty five, no more than a spit of an old woman, she carried herself slightly hunched at the shoulders. Thompson recognized her face and deep brown eyes and recalled how they had appeared years ago on a much younger and athletic body . “She was really somethin’ then,” he thought to himself. 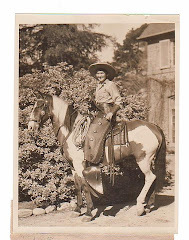 As a young girl, Rosa met and fell in love with A.C. Clayton a young, good looking cowboy raised on the Kansas plains. 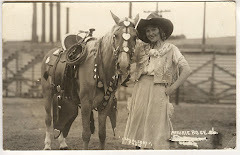 A.C brought Rose to Wyoming from her home in Bristol, Ohio. The two of them married and were happy for a time. They had two children, May and Henry. 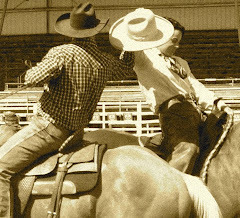 Competing in the annual Frontier Days events was a family affair. 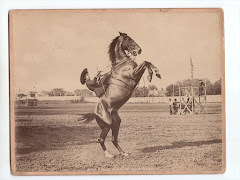 A. C. won the cowboy’s saddle bronc event a couple of times. May and Henry both won their events. But Rosey was the real star. 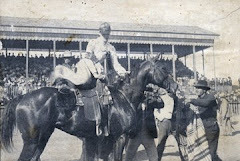 She entered the 1904 Cowgirls Relay Race with three borrowed horses and won in a thunderous blaze of glory narrowly beating out Joella Irwin. 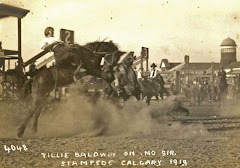 Two years later she participated in the very first official Cowgirls Saddle Bronc Event and took home the winners Gold Cup for her efforts. 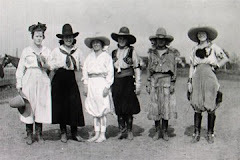 Hailed a local hero for a time and known throughout the area as “Prairie Rose” Clayton, she had been among the first of many local girls who competed in the Frontier Days celebration. 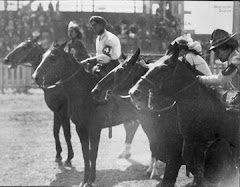 The judges were hard pressed to come up with any ruling that would prohibit girls from riding with the boys in competition. They simply could not understand why in tarnation she would want to! Rosey pressed her point and legend has it the judges let her ride. But nothing was recorded in the official results. 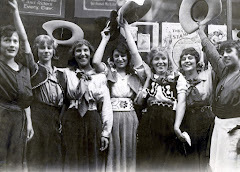 In fact, nothing was ever reported in the local papers and the event was for the most part forgotten. 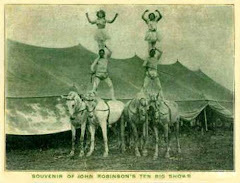 A.C. and Rose weren’t carnies or shipped in by train from some wild west show in the east. 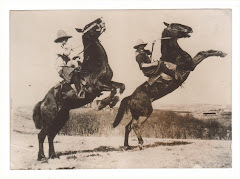 They were hard workin’ local folk, come to town for some fun, escaping from the day to day sameness of the ranch, just showin’ how they do it on the ranch, just showin’ how they do it real. Somewhere along the line, the marriage unraveled and the two very unhappy participants had different versions of a failed and hard marriage. One version may be just as true and no truer than the other but the sad reality was simple; Rose became a divorced mother of two. She was left on her own and it was her duty and sole responsibility to support herself and her children. As any mamma bear would do, she resigned herself to go wherever and do whatever needed to be done to feed and clothe her children. 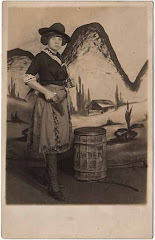 Someone told her about a job in Utah for a cook in a mining camp and without any further thought, she and the children were packed and on their way to a new future. It isn’t known how long she stayed but eventually, she found herself in California where son Henry eventually became a plumber in Los Angeles. 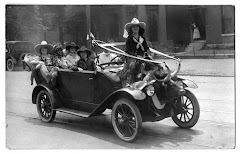 It was in California that Henry would find his wife, Anna Robbins from Ohio and Rosa would find and marry Charley. Life always seemed to find it’s way. Sheriff Thompson found himself smiling, recalling those early days of the famed Frontier Days celebration. He wondered how she ever ended up with the likes of Charlie Coleman, a man who was no stranger to trouble or the inside of a jail cell. 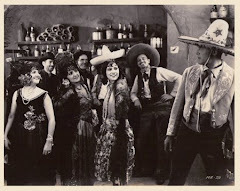 Thompson rushed quickly back into the present moment as Charley came to the door and stood behind Rose. Coleman had become a familiar figure in town. He had been trying without much luck or skill to make something of that small piece of dirt he and Rose had bought a couple years ago but it just wasn’t meant to be. Money ran out and he butchered another man’s property. Now he had to pay the price. Thompson opened the screen door and took Coleman by the arm leading him away from any sanctuary the man may have found inside his home. 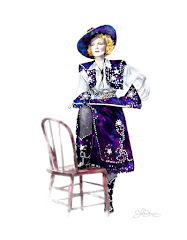 “Charley, you’re under arrest for cattle rustling and butchering.” He glanced back into the doorway of the house toward Rose, now visibly shaken, tears rolling slowly down her cheeks. Not really surprised, she silently accepted her husband’s fate. Thompson glanced back at the woman standing on the porch, wrenching a dish towel between her shaking hands. Knowing there was nothing more he could do for her, he focused his eyes squarely on the road ahead and drove away. Rose stood on the front porch crying as the car slid down the driveway and out of sight. 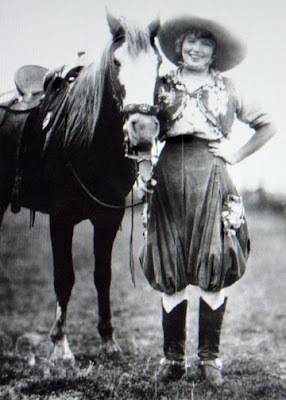 She had been the one to talk Charley into trying his hand at ranching and move with her, back home to Wyoming. It hadn’t worked out well. 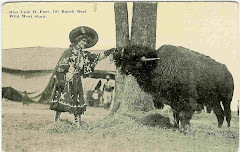 Charley was not above expressing his displeasure with his fists and had let Rose know many times how unhappy he had become in Wyoming. Looking through her tears Rose allowed thoughts of freedom to enter her mind, in maybe a small way. She wondered how she could escape her husband's wrath if she somehow rekindled her courageous spirit and left this place. Her mind raced forward to a safe place with her son in California. 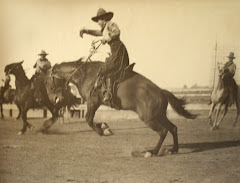 Just as quickly as her spirit soared out of Wyoming, fear and guilt would bring it back and once again she would find comfort and familiarity in finding yet another reason to stay with the man. It simply never occurred to her that Charley was who he was and there was nothing she could have done to change him. 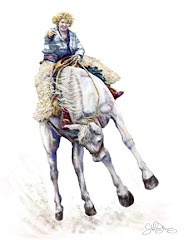 Snow was falling heavy in a frenzied, sideways journey, rushing across the pasture and sticking to anything in its path. Mrs. Coleman knew there was little, precious time to bring her pony to safety and out she headed toward the barn for a halter. Grabbing the halter, she held it close to her body and disappeared into the cold, blinding whiteness. Once back at the office, Sheriff Thompsons thoughts returned anxiously to the woman up on Green Mountain. His deputy had just returned to the office and was warming his hands above the fired up woodstove. 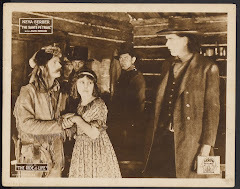 “I had to bring Charley Coleman off the mountain today but his wife is up there all alone. Would you pick up some supplies and take ‘em on up to her? I’m worried about her bein’ there all by herself. The snow’s getting’ real bad and she’s gettin’ up there in years. Knowing the nearest supply store was several miles away from the folks who lived on the mountain the young deputy didn’t hesitate. He swaggered over to the coat rack by the door, grabbed his heavy green jacket, still wet and soggy, and headed back out into the storm. The deputy loaded the car with several boxes of food and supplies and drove back up the mountain to deliver the package to Rose Coleman. “Oh, man it’s a comin’ down now.” He took his hand and wiped the wet foggy mist away from the windshield. Squinting, he attempted to focus through any small space in between the barrage of blinding white flakes. He looked desparately for the woman loosing hope with each passing moment. Finally, he acquiesced to the cruelty and power of the storm. The ride back to the office was devastatingly slow. 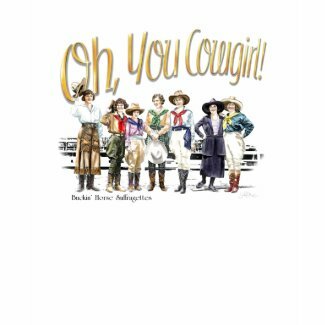 Fearing the worst, he dreaded facing the sheriff with the bad news. 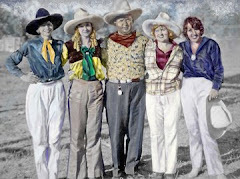 The next day Thompson and two additional men returned to the ramshackle ranch to look, once again for Rose Coleman. Time and again he would make the trek back up to the harsh, loneliness of the mountain country, now blanketed with deep snow, hoping in vain to find some trace of her. Sadly, he would concede; Rose Coleman was forever lost somewhere on Green Mountain to the winter storms in the season of 1933. Charles Coleman pleaded guilty to butchering cattle and spent more than one year in the state prison. 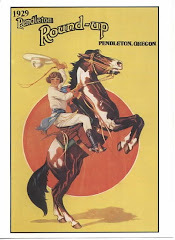 Still no one listened and the story of the death of the famous Prairie Rose Henderson persisted and gathered momentum. 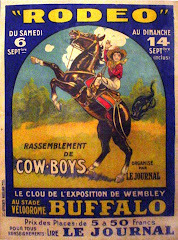 Fog Horn Clancy, the famous promoter and rodeo announcer picked up the story and wrote about it in his column in Hoofs and Horns. Oddly, no report or story can be found of the many friends or colleagues of Prairie Rose Henderson who were to offer condolences at a funeral or graveside service. 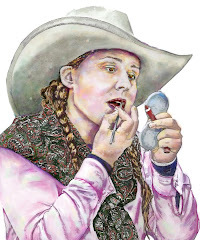 Nor could any words of remembrance be found in any of the many papers that had covered her every move and action at the various shows and rodeo’s she performed in. Close friends Mabel Strickland, Florence Hughes, Bonnie Gray and Lorena Trickey said nothing and nothing was ever reported about any grieving family members. 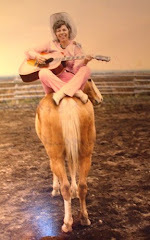 There was never any kind of memorial or funeral service for the great Prairie Rose Henderson. No official obituary. No death certificate. No coroners report. Not for the great Prairie Rose Henderson. A woman died in a terrible blizzard in 1933 and Prairie Rose Henderson ceased to exist. Charley could see the man was peering at something heaped beside a rock and he ran fast down the hill, kicking the hot, dry smoky dust into his eyes and sucking it deep into his lungs with every open mouthed breath he took. The sheepherder looked up and into Charlie’s eye’s as he rushed up, just within two feet of a small bit of half buried, crumpled blue material. Bones, barely recognizable as human could be seen within the torn trousers. His soul aching with the chilling certainty of what he was looking at, Charley couldn't take his eyes from the gruesome discovery. It was all that remained of Rosa Gale, daughter of Ezra Gale from Bristol, Ohio. 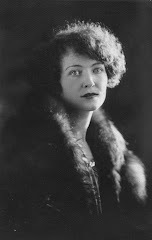 A.C. Clayton’s first love, Henry and May’s mother and his wife. Charley looked over, just to the right of the body and recognized the leather remnants of what was a pony halter. It was the one Rose had grabbed from the barn that stormy morning seven years ago. “Ah, no. Oh, my Rosey.” It was more guilt than sorrow that brought Charley to his knees as he wept beside her body. Finally, the world was convinced with absolute certainty the fate of Prairie Rose Henderson and Henry Clayton returned home to California to grieve his mother. 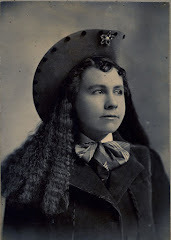 Rumors spread that the skeletal remains of Prairie Rose Henderson were identified by a championship belt buckle she had won was still shackled to her body. Some say she had conquered her fear of storms and after her husband was arrested went out to look for her favorite pony to bring him to shelter. People would agree, “Yes, that does sound like the Prairie Rose. 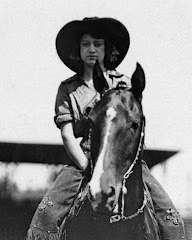 She did love those horses.” Once away from the house, she became disoriented and snow blind and perished for eternity. It is curious that Prairie Rose Henderson had many friends but not one came forth, as friends do in these times, to remember her and maybe even shed a few tears as they said goodbye. 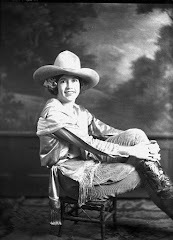 No one came forward to claim the bones of Prairie Rose Henderson, World Champion Cowgirl and Bronco Rider, the Sweetheart of the Rodeo. Rosey Claytons tragedy was forgotten in the apathy of time just as completely as if it had never happened, there on Green Mountain. 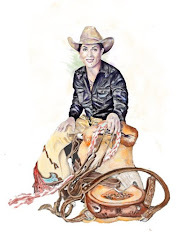 The legend of Prairie Rose Henderson lived on in newspapers, stories, books, all continuing throughout the years to report the hard end of the great cowgirl up on Green Mountain, in a Wyoming snow storm. 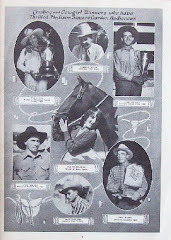 Coast to coast news of her death shocked the fans who had watched her ride the pitching bronc’s, winning countless championships, dressed in her own remarkable creations of Mink, Maribou, ribbons, sequins, velvet and beads, always wearing her famously large Sombrero. Knowing the true identity of the ill fated woman who died on Green Mountain, Rose Clayton-Coleman offers little comfort for, if it wasn’t Prairie Rose Henderson who died in that snow storm, what did happen to her? Why did she simply vanish, never to be seen or heard from again? 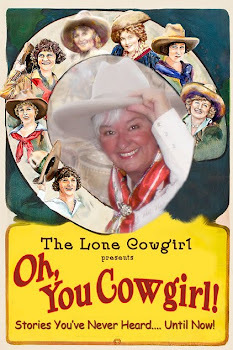 The Lone Cowgirl says "Stay Tuned!" If she didn't die in that snowstorm, what did happen to Prairie Rose Henderson? 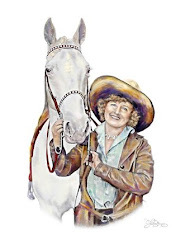 Why did she leave her great legacy behind in the west? 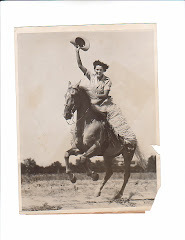 Labels: cowgirl, Cowgirl blogs, cowgirl documentary, cowgirls, Early cowgirls, prairie rose henderson, rodeo cowgirl, saddle bronc, women in rodeo, You Cowgirl"
Wow, what a chilling and sad story. Can't wait to read more. Well I find it interesting! Seems there were a few Roses and the press always "assumed" it was the Prairie Rose without looking into it. So where did the real Prairie Rose go? Was it a good excuse for her to hang up her hat? Fascinating! 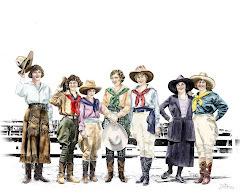 I love learning more about those "old-time" cowgirls. 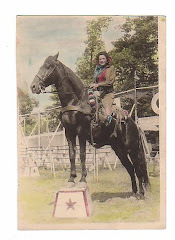 (My grandmother was one, lesser known, but a steer rider in the 1920s). You have a wonderful, interesting blog. I' ve enjoyed looking around. What a fun blog. I'll definitely be back! Nice and very different. Those old pics always make me smile. 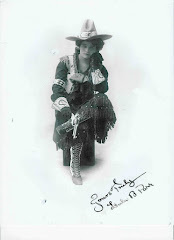 I just purchased a antique handgun that was reported to have been owned by Prairie Rose.